Billed as one of the earliest styles of American beer before being nearly wiped out by American lagers, this beer falls under the category of a Cream Ale. Sun King Brewery has brewed up a Cream Ale and has embraced it as one of their standard house styles. Their particular beer is called: Sun King Sunlight Cream Ale. 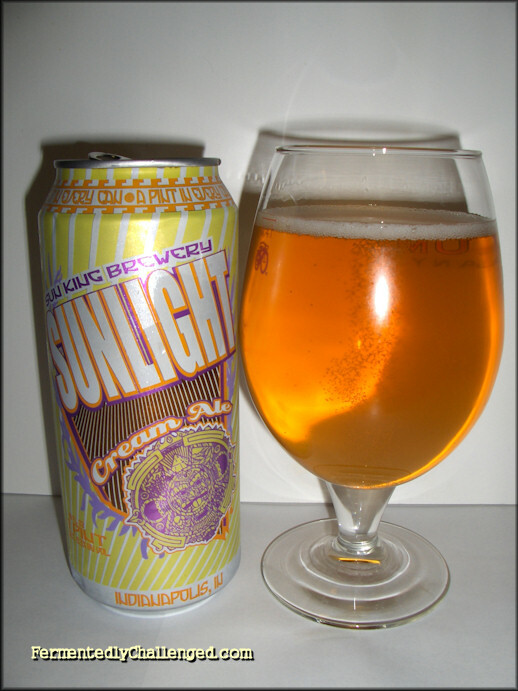 Sunlight Cream Ale was intended to be a sessionable beer and weighs in at 5.3% ABV and is lightly bittered at 20 IBUs. Calorie counters will find that this brew has around 179 calories per pint. This is also known as an award winning beer having won a Silver Medal at the 2010 World Beer Cup in the Golden or Blonde Ale category. This review is just one of four beers reviewed in a series about Sun King Brewing Company of Indianapolis, IN. They were generous enough to send out four of their beers for this blog to sample and review. It has been an extremely long time since I've had a Cream Ale. Last one I remember having was a Genesee Cream Ale and a Little Kings Cream Ale, but that was a couple decades ago. Since I tend to review bigger, bolder and hoppier beers, would I like having a Cream Ale? I was eager to find out. Cream Ales tend to have adjuncts added to the mash like corn and have extra sugars or glucose added as well. Appearance: Sun King Sunlight poured a light yellow color and when poured gave out just a small 1 finger white head that quickly disappeared. The beer had good clarity with no haze or sediment visible. The beer seemed to be adequately carbonated. What little lacing there was quickly melted away. Aroma: The nose on this cream ale had a very light malt aroma with some sweet fruit-like tones. The aroma reminded me of some pilsners I've had. There was a bit of grass and biscuit present as well. Very light aroma with little trace of hops present. Taste: It took several sips to figure this beer out. The beer was light bodied, smooth tasting and had just enough carbonation. There was an underlying sweetness to this beer with just a hint of fruit. The beer was lightly bittered, but that matches the style. It was VERY easy drinking and I found it went down with no after taste. If ever there was a beer that even a beginning beer drinker would love, this would probably be it. It was crisp, not as bitter as a pilsner, and came with a background of slight sweetness. Overall: This was definitely matching my definition of an outdoor warm weather beer. Sun King Sunlight was meant for warmer sunny days. It tasted good both cold and after it had warmed up a bit. Cream Ales are a style that every brewery should made at some point as I bet they would sell a lot of it due to it's easy drinkability. This beer is one that is very sessionable and I'd have no problem downing a few of these on a hot day. Disclosure: This beer was given to me directly by the brewery at no charge. I was not paid for this review.